HUMBOLDT – As much as most Humboldters treasure their natural surroundings, there are those who Just. Don’t. Care. 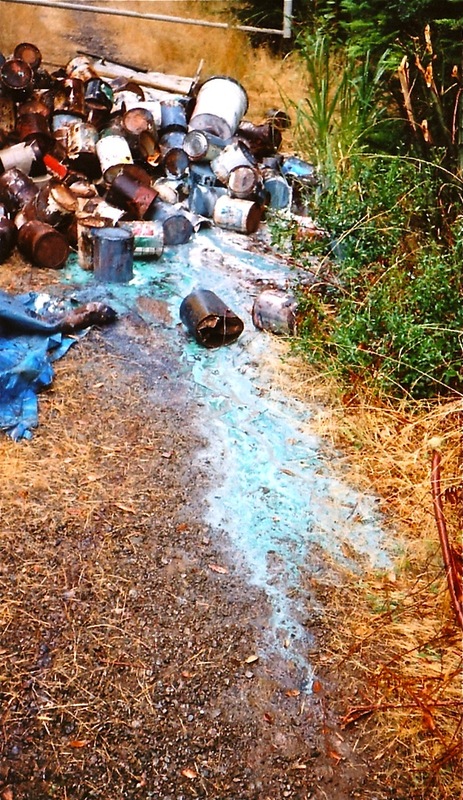 On Tuesday, Sept. 7 at 7:30 a.m., Humboldt County Sheriff’s Office deputies responded to Green Diamond Resource Company property off Maple Creek Road, approximately one mile east of Korbel on a report of a hazardous materials spill and dumping. 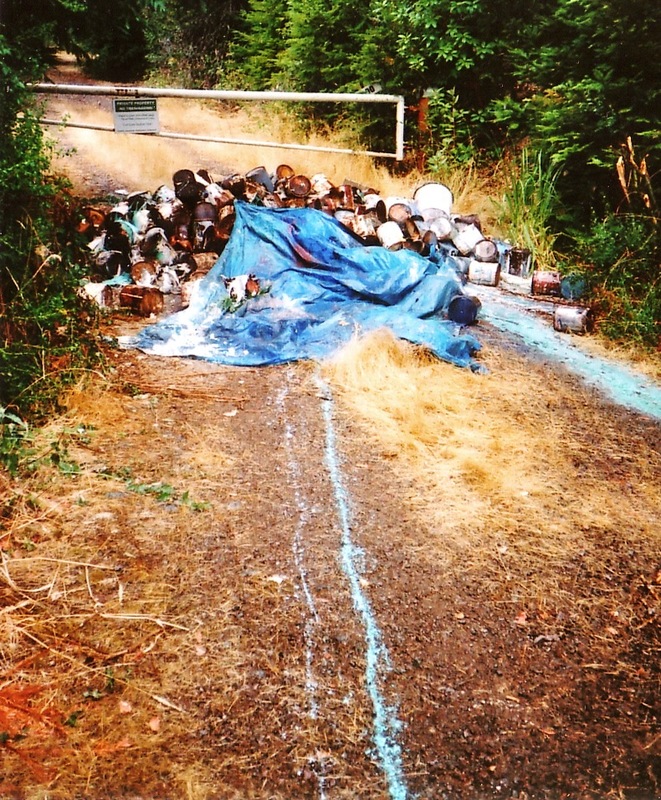 Upon deputies’ arrival they discovered 95 five-gallon containers and five one-gallon containers of various types of paint had been left near a Green Diamond Resource Property gate. Some of the paint was oil-based and some was latex-based. Most of the paint was still in the containers, however some had spilled onto the ground. Some of the paint containers still had labels on them and some labels had been removed. There are no known suspects at this time, but the investigation is continuing. The Sheriff’s Office is asking for the public’s help in locating the suspect(s). It is believed the suspect(s) dumped the paint between 5 p.m. on Friday, Sept. 3, and 10 a.m., Sunday , Sept. 5. HCSO can be reached at (707) 445-7251. Another view of the heap. Later that day, at about 4:30 p.m., HCSO was again contacted by Green Diamond Security, which had located a second dumpsite. Deputies were dispatched to the scene, which was located approximately nine miles out Maple Creek Road from Korbel. Deputies located a pile of approximately 150 one-gallon paint cans on the ground. Many of the cans had broken open and paint had spilled onto the ground. There were also five five-gallon buckets of paint at the scene. Part of the pile of paint cans was covered by a blue plastic tarp, which was consistent with items located at the first dumpsite. 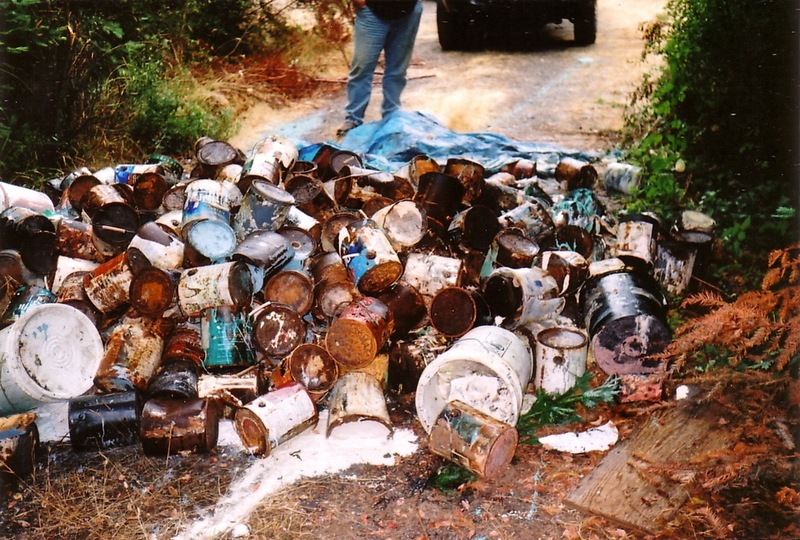 The Humboldt Waste Management Authority offers a Household Hazardous Waste Facility in Eureka which accepts paint and other toxic materials. There is a $5 fee for up to 15 gallons of liquids. This was the dumper's view of the mess as they drove away from it. Have you seen a truck with pale blue paint splattered on the back? This entry was posted on Wednesday, September 8th, 2010 at 9:03 pm	and is filed under News, Environment. You can follow any responses to this entry through the RSS 2.0 feed.